New Delhi: The Bharatiya Janata Party (BJP) on Saturday denied that its President Amit Shah had made any statement in a Hyderabad meeting on Ram temple in Ayodhya even as AIMIM chief Asaddudin Owaisi questioned him for speaking on the sensitive issue that is being decided by the Supreme Court. “Yesterday in Telangana, BJP President Amit Shah did not make any statement on the issue of Ram mandir as being claimed in certain sections of the media. No such matter was even on the agenda,” the BJP said in a tweet. The Babri Masjid-Ram Janambhoomi dispute is in the Supreme Court. All India Majlis-E-Ittehadul Muslimeen chief Owaisi on Saturday said it was better if the Ayodhya judgment came after the 2019 general elections as it would influence the election outcome. In a tweet he questioned Shah’s speech in Hyderabad, asking him if he was “going to write the judgment when the Supreme Court is deciding the title dispute and whether Masjid is an essential feature of Islam”. “It is better if the…judgment (is) given after parliamentary elections for free and fair (polls),” Owaisi said. 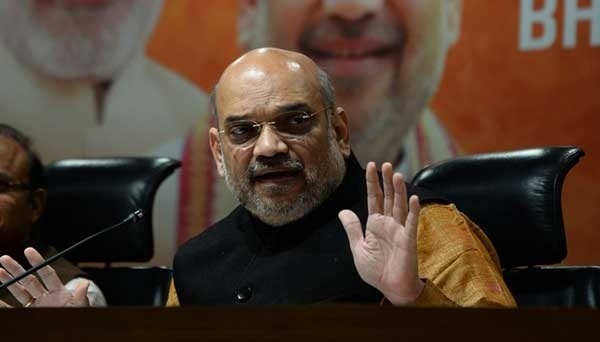 Shah on Friday held a meeting of party leaders in Hyderabad after which BJP National Executive member Perala Sekharjee briefed the media about it. Quoting Shah from the meeting, Sekharjee said that steps would be taken to clear the decks for launching construction of the temple before the polls. The BJP had also released a statement in Telegu about Shah’s meeting indicating he spoke about the Ram temple issue.